Great blue heron hiding in the bushes. I think I woke him up from his nap. Tiniest frog I've ever seen. This is blown up. I almost stepped on him. Mallards walking around keeping an eye on me. Blue jay with a nut. Male grackle shining in the sun. Another hot walk around Kapok Park after work. Kapok is a small park right in the middle of some neighborhoods off a busy road. It used to be a trailer park and was turned into a water management project. It's named after the tall kapok tree that is an emergent tree in the rainforest that grows tallest over all the other trees. I couldn't find any information on how Clearwater Florida got some of these tree. In the winter there's a lot of unusual wildlife there but in the summer it slows down a bit. There weren't too many people there as well. Things were pretty quiet while I was there. Female grackle sitting on an abandoned boat. The usual willets are always hanging out around the jetty. The oystercatchers were pretty skittish. They would not let me get too close. A tern sitting on some type of buoy or anchor. Nothing unusual was found on my trip to the Davis Islands yacht basin. Just the boring ole oystercatchers, willets and terns. It's still too hot to see anything good but soon the migrating birds will be coming through in bigger numbers and before you know it the eagles will back. I'm counting down the days for when it's no longer hot and the fun winter birds are here. It's only about 100 more days, give or take 10. Pelican hanging out before sunset. He looks like a juvenile. His feathers are so pretty. Juvenile night heron turning from brown to gray. This was the first time I had seen a night heron that had just a few brown feathers left. He's almost an adult. Just a few birds from my last trip to Redington Shores to see the baby skimmers. The beach had a few shorebirds on the beach right before sunset. I found the night heron hanging out at the Suncoast Seabird Sanctuary. I was surprised to see the patch of brown still on him. I've never seen seen a night heron in mid molt. I've only seen the blue herons who start out white and then turn blue in mid molt.﻿ Night herons don't seem to show much emotion. They just sit there quietly. I see the first shrike of the day on a wooden bench. Then I realize there's a few more shrikes in the trees. I sat on a picnic table under the tree and was watching them. One flies onto the picnic table with a worm in it's mouth. It seemed to be showing me his catch. I had to get up and back up since he was to close to get a picture. I spotted another one with a worm on the ground. I finally started to leave and stopped along the seawall to take a picture of the jellyfish. This little guy flies down and sits right next to me. Was he trying to tell me something? He then flew over to the nearby tree. I followed him and took the below picture. On my recent trip to Davis Islands, I must have seen at least 10 loggerhead shrikes. The most I've ever seen together at one time is 3. They were everywhere in the trees that run along the sea wall. They acted like they were used to having people around and got pretty close to me. They are tiny songbirds that hunt their prey like a hawk. I've always had a hard time getting decent pictures of the face with the black mask trying to hide their eyes. I was happy the sun was out and gave off good light that morning. I did use my flash on the one with the worm since he was sitting under the tree in the shade. A view from the yacht basin. Jellyfish were floating along the top of the water along the basin. This is the first time I've seen them there. Nice to be paddling and choking on that air. A fun game of frisbee football going on. A view of downtown Tampa from Davis Islands. I was standing next to the dog beach. I hadn't been over to Davis Islands to walk around for a while. I thought maybe there would be a breeze along the water. I was wrong again. Even in the early morning heat there were tons of people everywhere. The small dog beach was full. There was a paddleboarding lesson going on. Lots of people running, walking and biking. The sun was out in full force. No clouds until later on. I managed to find a few birds hanging around. More on those later. At 6:30 on a weekend morning I hear a bang, bang bang several times on something outside. It woke up hubby and myself. Hubby says half asleep "What was that?" I said "It sound like a woodpeck trying to drill on the metal drainpipe." He said "No way". I got out of bed and peaked out the window. Sitting on a branch, staring at the drainpipe was a downy woodpecker. I went and got my camera and took a couple of shots throught the bedroom window. He must have tried to bang on the drainpipe and realized it was metal. Our neighborhood dove was trying to take a bath in our dried up boat cover. When it rains we get a little puddle in the front of the cover. For several days we've had doves taking baths there but then it dried up. I told hubby to run outside and spray the boat cover with the hose so the dove could get wet. He said "I'm not getting up off the couch to spray the hose so a dove can take a bath." I guess a trip to Home Depot for a real birdbath is in our near future. A family of house sparrows has been hanging our the boat dock. I wonder if these were the same ones that were born here earlier this spring here. All of the above pictures where taken through the bedroom window. If I walk outside the house sparrows fly off and hide in my neighbor's bushes. They do that when a hawk stops by as well. I'm still waiting for hubby to build me a nice air conditioned blind to put in the backyard. Juvenile skimmer staring at himself in the pictures. The cones above were stationed all over the beach area where the skimmers had been nesting. Juvenile skimmer getting a drink a water. He kept his eye on me. This was my first time seeing a baby in the water. Getting some shade under a sign (or hiding from the tourists). Ready for take off. He didn't go very far. I'm sure there's still a few straggler babies hanging around but by now most of these are gone. I took these a couple of weeks ago after work. I would think the parents are tired of staying in the same spot for several months and are ready to move on. I'm not sure if the babies go with the parents or take off on their own right away. Most of the year you won't find many skimmers on this stretch of beach so I probably won't head back here until early next spring. It was so much fun watching these little birds grow up but nerve wracking as well. Watching them fight over space and food. I saw a few ones that didn't make it. I'm not sure if there was an official count done but there had to have been at least 100 babies born in this little spot this year. 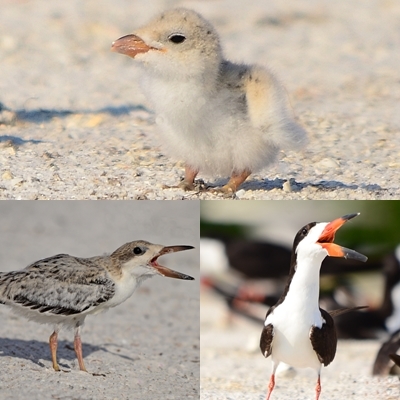 Hopefully, next year I'll be back with a new batch of baby pictures.﻿ Below is the 3 phases of the black skimmer. 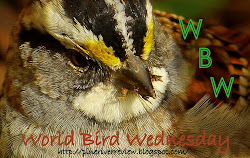 Check out more birds at World Bird Wednesday. Green heron hiding in the trees. Great blue heron posing in front of the St. Petersburg downtown skyline (way off in the distance). I think this is a silk orb spider. Looks like there's a baby one with it. "Hey, I'm over here, otter." He popped up far away and looked like he was eating something. I snapped quick but wasn't really ready for this shot. It didn't come out well but I realized when I cropped it up he was eating a small turtle. He chowed down for a few seconds, then went back down into the water. A family of four raccoons went quickly scurring by me on the trail. The smallest one stayed back and climbed half way up the tree and was watching me. After a few seconds he climbed back down and hurried to catch up with his family. This big slow guy wasn't going anywhere. He stopped munching on the grass for a few seconds and looked up. Lily pad flower upclose. The water was full of them. Lots of tiny bugs hanging out on them.